Governor Kitzhaber’s and the Oregon Education Investment Board’s Achievement Compacts raise some interesting questions. I am not sure the OEIB understands the answers. There are three areas which are addressed from the state’s perspective. School districts are asked to increase their test scores, to increase their graduation rates, and to decrease their absentee rates. Let’s look at these one at a time. It seems the OEIB assumes that increasing reading test scores means you are increasing reading achievement. This would be the case if the tests actually measured reading in general and the tests could not be manipulated. But that is not the case. Schools long ago figured out that teaching to the test increases test scores, as does focusing on the tests to the detriment of other important educational topics. In effect the OEIB’s emphasis on test scores often weakens the education of children, particularly poor children, children with disabilities, and children who have a basic language other than English. Poor children because schools with wealthier populations generally do fine on the tests so they don’t need to emphasize them to the same degree. Children with disabilities and ELL children because it detracts from more important things that should be taught. A better approach would be the one which was used for years in American schools. Make sure all children could read decently well and further develop the vocabularies of children who could read through other subject areas and lots of reading. By narrowing the curriculum we also narrow children’s background understanding and vocabularies. By cutting trained librarian-media specialists and library budgets in general we limit how much children read. You have to wonder if the OEIB understands this and is just stuck on the idea of measuring or if they just don’t get it. There has been a lot made of the idea that the new testing when it comes about will not reward or punish schools or teachers for how many children pass benchmarks, but for how children do overall. Hence, the elimination of the bubble children, the children just below passing who garnered way too much of the attention in school after school. The new problem is that now all the children will become bubble children. So, even the schools which previously did not have to worry about having many children who didn’t pass will need to worry about every kid doing well on the test. This approach very likely will widen the negative aspects of teaching to the test and narrowing the curriculum, not decrease them. Graduation rates are a different matter. Everyone can agree that graduating from high school is a worthwhile goal. The problem is that two things are critically important to this effort. First, you need engaging classes and activities to help kids stay interested in school and second is that a school needs to support those kids that are not getting enough support from home. Improvement in the first is fueled by money. Auto shop, art, music, after school activities such as drama, journalism, sports and various other interesting classes and activities which really engage kids cost money. The OEIB is not increasing Oregon’s funding to help here. Counseling and wrap around activities which support kids who need it also cost money, just not as much. A high school or middle school can add support by changing its priorities some, but this is extremely difficult given the other demands being placed on time by the state. What is the OEIB doing to alleviate the time and money crunch here? Nothing I have seen. A better approach by the OEIB would be to offer help and support for these solutions. Not just say, fix it, but here are ways we can help. The third area is not so difficult – decreasing absentees. Schools serious about this need to develop automated calling systems to alert parents , a strict policy of daily attendance monitoring, people available who can do home visits to encourage attendance, a welcoming school attitude, and a school nurse program. It wouldn’t hurt if they served healthier food and taught general hygiene in their health programs either. But some of this costs money, particularly personnel. Not only is the state not monetarily supporting these programs, but its testing policies work against them by wasting money and time and narrowing the curriculum. 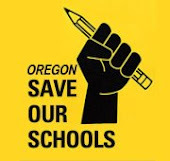 So it is easy to ask if the Governor, Dr. Rudy Crew and the OEIB have any real understanding of the implications of achievement compacts or whether or not, as is often suggested in our Oregon SOS meetings -- they are just blowing smoke.